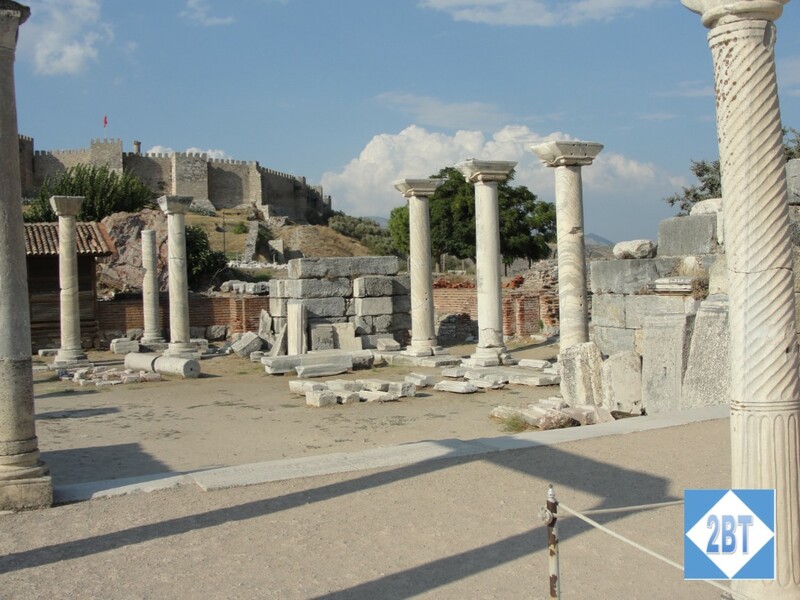 I knew that Izmir (the ancient city of Smyrna) was close to the ruins of the ancient city of Ephesus, which I had toured before while on a cruise. I thought it was fantastic and wanted my friends to be able to experience it. Through a travel agent friend I was put in touch with the folks at Sea Song, who are top travel specialists in Turkey and Virtuoso agents. While we probably could have put together some of these details on our own, we were able to concentrate on flights and hotels in Istanbul and we put our ground transportation and tours in their hands. Our guide and our bus driver, yes we had a small bus even though there were only three of us, picked us up at our hotel and we were on our way. The ruins of Ephesus are about an hour away from Izmir via a modern highway, so it was an easy ride. The ruins are on a hillside and the driver drove us to the entrance at the top of the hill and we wound our way through the town down the hillside. The book of Ephesians in the Bible is actually a letter written from the Apostle Paul to the city’s inhabitants. He spent a fair amount of time there, preaching and making tents. 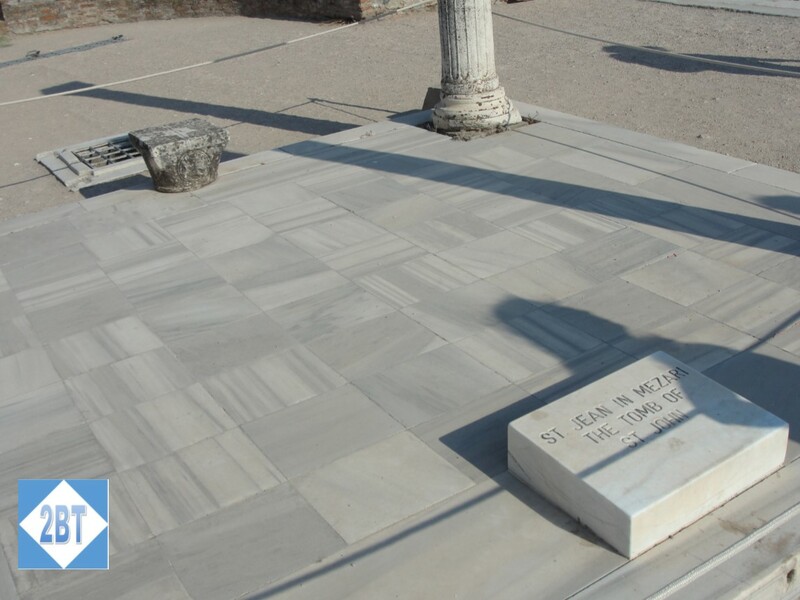 Shortly before the birth of Christ, Ephesus became both the seat of the regional governor and a major center of commerce – in short, a very prosperous city. Much of the remains we see now are from that time period. 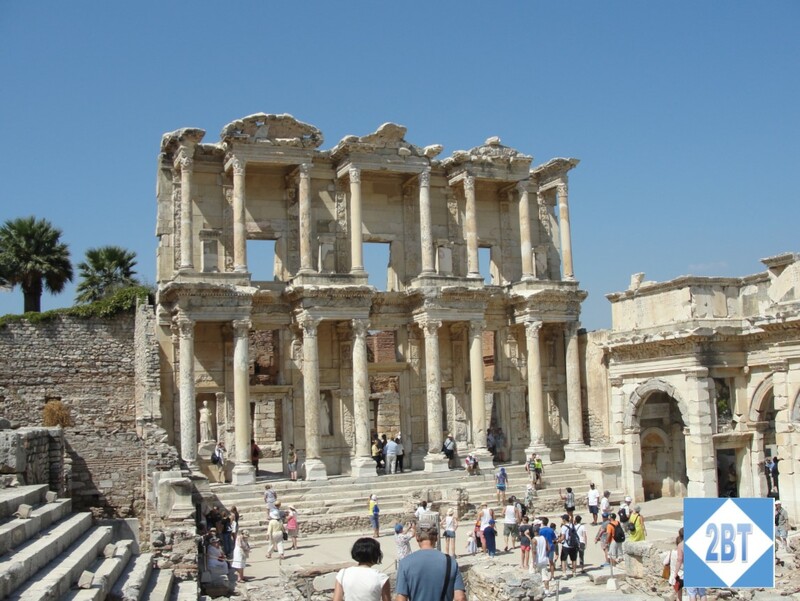 It’s best remembered for its temple to the goddess Artemis, the library of Celsus and its amphitheater, which could seat 25,000. We also got to tour the Terrace Houses, where excavation is on-going. Here we saw where the wealthier citizens lived. 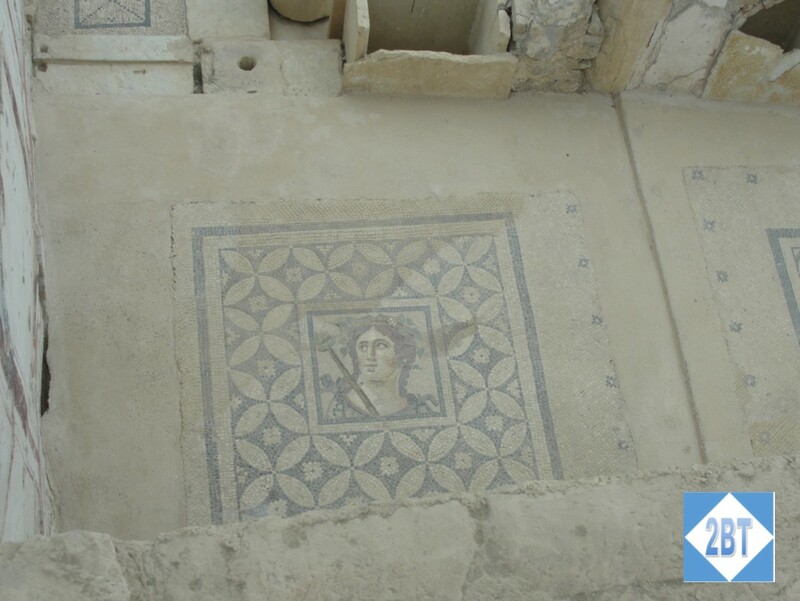 The floors all had mosaics and the walls were intricately painted too. These homes were up a side hill from Curetes Street, the main street of the city. The street itself is made of marble, which made it quite slick with all the dust from the area. 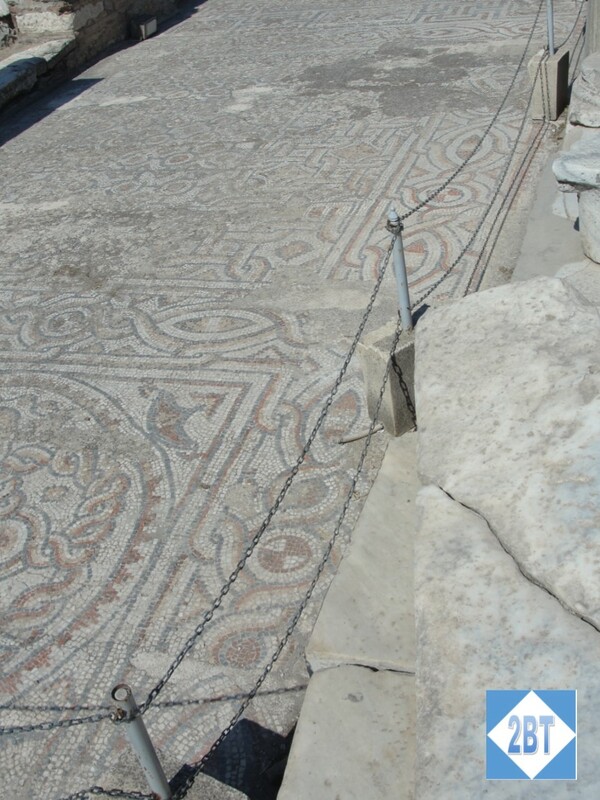 The sidewalks, which were roped off, were elaborate mosaics that have held up amazingly well over the centuries – or perhaps just beautifully restored. After finishing the tour our bus took us to a small restaurant in Selcuk, the town closest to Efes, where we had lunch and enjoyed some time in the shade. Aside from our time at the Terrace Houses, an area that’s covered, the rest of the time in Ephesus is out in the open and there’s very little shade to be found. So it was nice to be able to cool down for a bit. Our next stop was the House of the Virgin Mary. While it’s not known for sure whether the mother of Jesus spent her final years here, it’s not out of the realm of possibility. There is a whole list of reasons why this might have been her house, but no one knows for sure. Additionally, the structure now on the site was “reconstructed” based on the finding of about a 2-3 foot section of wall. No photos are allowed inside. It’s very small and even though there was a line, it moved reasonably quickly. It was nice to see but if you don’t see this site, you haven’t really missed much. The final stop was at the Basilica of St. John. It’s believed that the man charged to take care of Mary upon the death of Jesus lived out his final years and was buried in this area. Some 300 years later a small chapel was constructed over his grave and that was expanded into a basilica in the 6th century AD. The building became a mosque in the 14th century when the Turks invaded the area but later that century an earthquake left it unusable. We enjoyed our tour and our guide, Tilda, was fantastic. She was our point of contact within Izmir, escorting us to and from the airport as well as on this tour. I’d highly recommend her as a guide! After traveling for three days in a row and then being gone all day on this tour we were definitely ready for some recovery time and looking forward to our day of relaxation. My first ski trip this year was to Steamboat, Colorado, which is the first place in the western US that I ever skied. I’ve been back a number of times over the last 20+ years and have never stayed at the same place twice. This is my first time staying at a true ski-in/ski-out facility, the Torian Plum Condominiums. Our club members joke that as the club as a whole has aged, the more important proximity to the slopes is for us. With age typically comes a better income, so we’re now better able to afford better and closer lodging than we did before. Due to a mechanical issue with my flight from Atlanta, I arrived at the condo about two hours after the rest of the group. I prefer to take pictures before people have gotten unpacked and all their personal belongings strewn around so I don’t have photos, sadly. Our group had a number of 2BR and 3BR condos. The 2BR condos were in the same tower as the main office and the 3BRs were in the Creekside Tower. We had a number of condos that were identical in that they were all at the same point in the building (318, 418, 518) so that’s the layout I’ll describe here. At max capacity the condo can sleep 8, but that’s assuming use of the sleeper sofa, which we did not use as a bed. The master bedroom has a king, the 2nd bedroom has a queen and the third bedroom has twin beds. My friends in the master bedroom did wish for more drawer space. I believe there was one chest for both to use. The closet was large and did have ample shelf space. The ensuite bath had double sinks and a large standalone shower. There was no tub. Bath products in the condo were Aveeno brand. 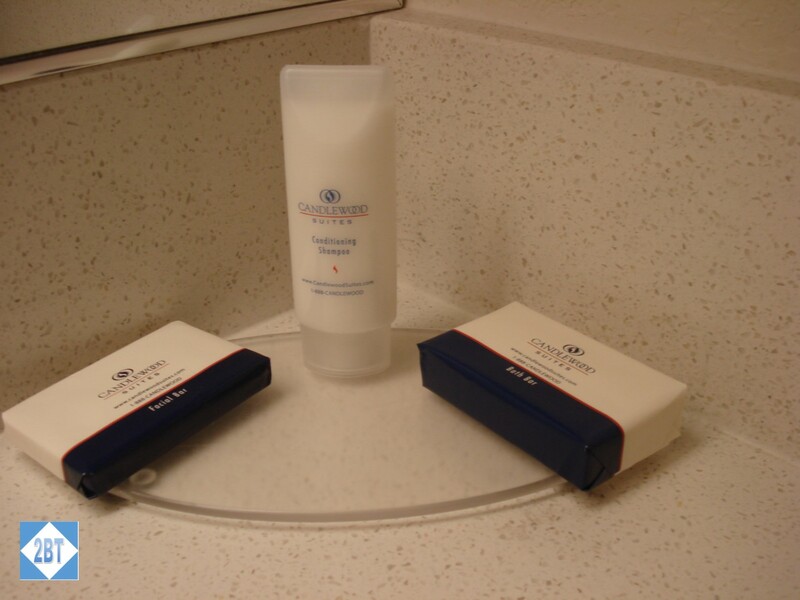 We received shampoo, conditioner, lotion and separate bars of soap for the sink(s) and the shower. The second bedroom also had its own bathroom. I did not ask my condomates about the shower setup there, nor did they mention a lack of drawers or whether they had ample. My roommate and I were in the the third bedroom with the twin beds. Our closet was much smaller than the master but still plenty big enough for a week-long trip. We used it to store our suitcases and I still had room on the floor in my half of the closet for my shoes. I used the shelf for some folded items. We had an armoire that was both the entertainment center and had three drawers for clothes. Our nightstand also had three drawers. There was also a rack of hooks on the wall so amongst all these options we had plenty of room for our clothes, with the exception of our ski gear and other coats. But fortunately the hallway was set up to handle those items! 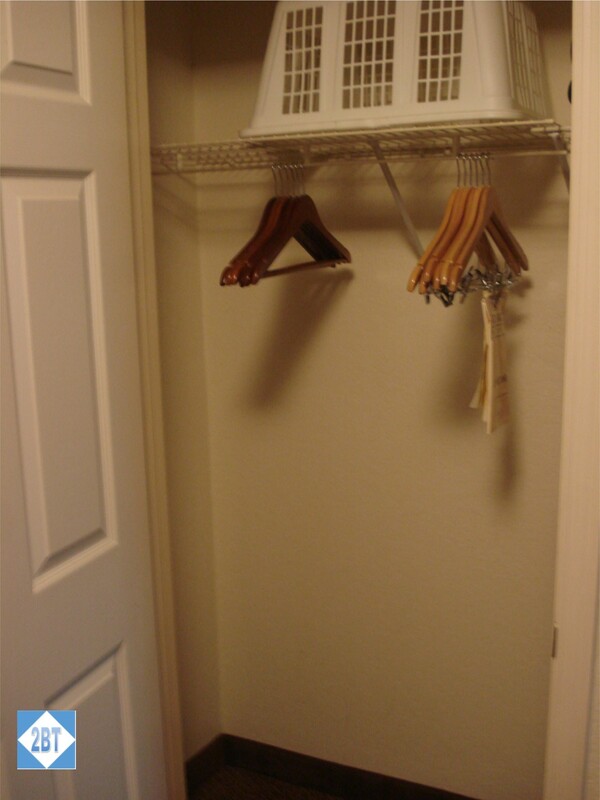 I loved that the large hallway closet could be used by all of us for our ski coats & pants. It was also large enough for me to store my skis bag out of the way. Elsewhere in the hall was a large set of cubbyholes that was perfect for storing our helmets and gloves. Underneath that was another selection of hanging pegs where we could put our coats and scarves, etc. Below that was a wooden bench that was perfect for removing our ski boots at the end of the day. The bench was tall enough that our boots slid in perfectly underneath them, keeping our boots out of the way. The combo living room/dining room/kitchen was very open, with a low bar counter & stool separating the kitchen from the living and dining areas. The table could seat eight so we were able to spread out a little when dining. Not being a chef, the kitchen had everything I could possibly need, though one condo-mate who cooked for the lot of us wished for more large-scale dishes so she could cook enough for us all at once. 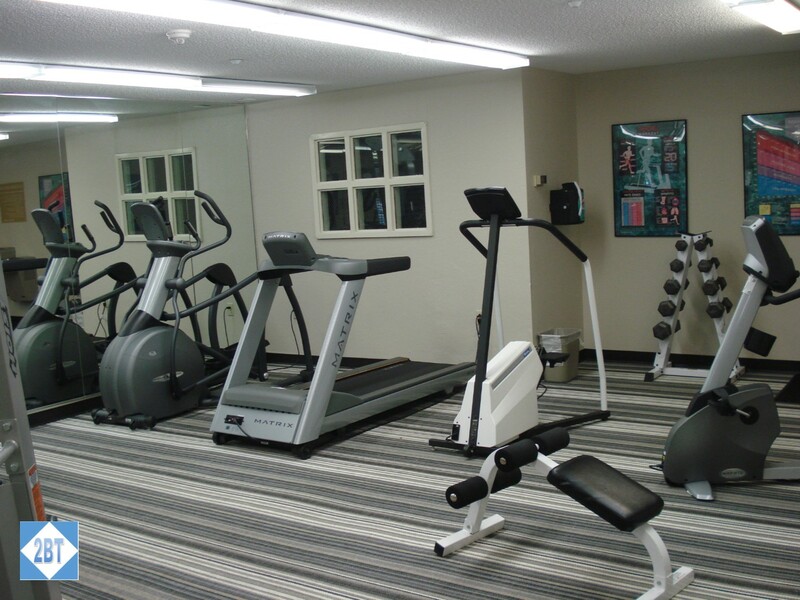 Each condo has a ski locker down on the first floor. From there it’s a short walk down a sidewalk, across a small patio and then you’re on the slopes. That small patio comes out just beside the Slopeside Grill, a long-time fixture in the area. We ate lunch there a couple of days, sitting on the patio, enjoying the sunshine. The complex has four outdoor hot tubs and a heated pool. 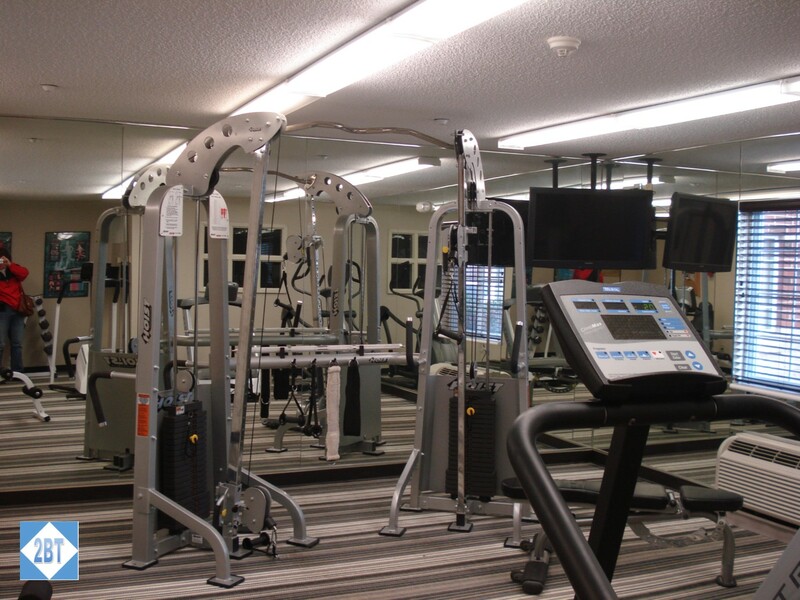 Swim towels, which are larger than the bath towels in the room, can be found in the locker rooms by the pool, or at the shower in the small fitness center on the ground floor of the Creekside Tower. I was pleasantly surprised that we got some form of maid service every day. Loads of fresh towels each day, they made our beds and took out the trash. In my experience, most condos in ski country typically get maid service maybe twice during the week, so this was a nice change of pace. 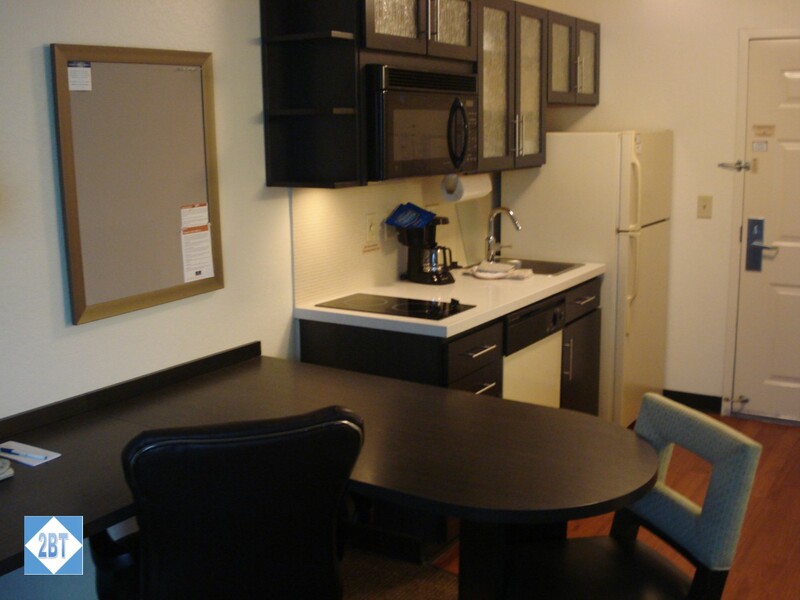 The condos are part of the Wyndham family of hotels and they have their own shuttle bus to take you into town. Just let the front desk know and they can arrange for the bus to pick up at the condos, drop you off wherever you like and pick you back up later. Very convenient! In short, I expect we’ll stay here again. You can’t beat the proximity to the slopes and we had a terrific stay. Yesterday I received an email from Points.com making me aware of a site called HolidayCheck.com. Holiday Check is a website that allows you to review hotels and other lodging and if they post your review you can earn airline miles for each review! Sounds a bit like Trip Advisor but with the bonus of miles. 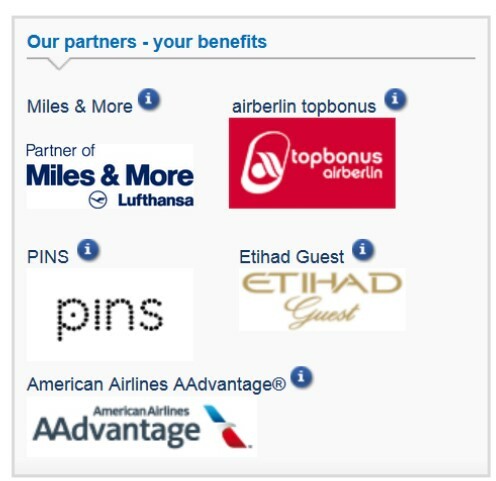 You can earn 100 Miles & More miles (the currency of Lufthansa and SWISS), 150 TopBonus miles (the currency of airberlin), 150 Ethiad Guest miles or 70 AAdvantage miles (the currency of American Airlines). I have no experience with this website but plan to post about my recent stays and see if I can’t earn a few miles in the process. It’s been awhile since I posted but I went on vacation so when I returned to work last week I had to pay for taking time off. That’s the way it always works, isn’t it? One thing I look forward to each year is taking my ski trips. 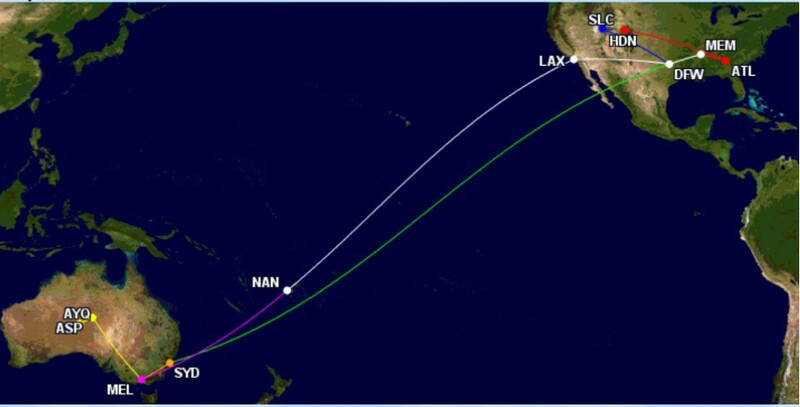 I aim for two week-long trips each year, usually one in January and the other in February. I know a lot of folks like the warmer spring skiing in March but (to a point) I don’t mind the cold and since I’m not locked into a school schedule, I like skiing when school is in session and not out for spring break. I typically travel with a ski club which means the only thing I can use points for is my airfare. But I don’t mind. I’ve been skiing with the club for over 20 years and have made a lot of new friends this way. And no matter who is in my condo, we’ve always had a good time – and this year was no exception. I’d used Delta miles for my flight which meant I could either route via Atlanta or Minneapolis for my trip to Colorado. While it may seem counter-intuitive to travel east to go west, in this case it made more sense to route via warm Atlanta instead of potentially snowy MSP. One downside of skiing is that you often fly into small mountain towns with limited/seasonal service and therefore the airlines can gouge you on pricing. In this case I was flying into Hayden, Colorado which is about 45 minutes outside Steamboat Springs. I have miles on the three major airlines that fly there but none had low-level availability when I was looking for airfare this summer. American wanted something ridiculous like 80K miles for an economy seat and United wanted 50K. Delta seemed a bargain at 45K – and I’d rather save my AA & UA miles for international travel anyway. I’d originally planned to vacation from Saturday to Saturday, arriving home in the 7-8 pm hour, just in time to go into work at 11 pm Saturday night. Then Delta changed the flight such that I wouldn’t land in Memphis until just after 10 pm. Uh, no, that was not going to work. In the end, a few days before I left for vacation I changed my flight to return on Friday. I hated to lose the day of skiing but was able to sell the last day of my lift ticket and had a much easier day on Saturday because of it and since the flight on Friday was a bit cheaper, I got back 5000 miles. That didn’t make up for the pain of the $150 change fee, since I’m not elite, but it helped a little. 2014 was an unusually heavy travel year for me. I normally like to take a ski trip in January and another in February and then another big vacation in the fall, with a weekend trip thrown in here and there. But when we were offered the opportunity to go on a river cruise in spring 2014, that meant I had to forego my fall 2013 big vacation, since my company’s vacation year is based on our fiscal year and not the calendar year. But it also meant 2014 would be very busy! I started out with ski trips to Breckenridge and Beaver Creek, CO and then took a long weekend with friends in Chicago in March. The European river cruise was in April and in September friends and I visited Turkey. I had one final trip to Chicago in October to obtain Global Entry for the next five years. That’s a total of 30,862 miles in a year. While I realize that’s peanuts in comparison to true road warriors, it’s quite a lot for me! The best part is that at least the last three trips were all paid for with miles. They weren’t free – the first class segments on British Airways had large fuel surcharges – but they allowed me to travel in comfort and be much better rested when I arrived that I would have been if I’d flown in economy. What’s on the horizon for 2015? Much less travel as of right now. But so far I’m only using points, even for my domestic trips. I am flying in economy on my first trip of the year but because I’m using points I paid for the extra legroom on the two longer flights. I’m not that tall but my legs are long enough that I really like the extra space. I’ve got a “round” birthday coming up this year and decided to celebrate it in style, Down Under. I’ve got all my airline tickets booked (on points, of course!) and a couple of the hotels. I’m working on gaining the points for the other hotels by the end of March. I’m very excited about this! With no trips currently planned between February and October, I imagine I’ll have to get away for a long weekend this spring. I will head back home for Mother’s Day. If my dad doesn’t come to Memphis for the golf tournament, then I’ll go home for Father’s Day too. What kind of travel do you have planned for 2015? A couple of hotel chains are kicking off the new year by offering brand new promotions! 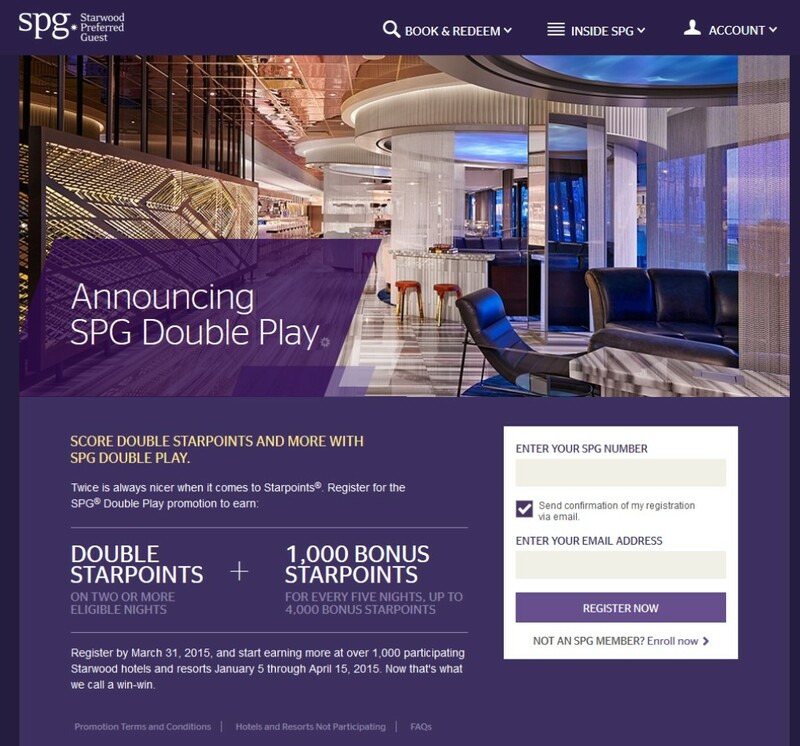 The SPG Double Play promo allows you to earn double Starpoints on stays of two or more eligible nights as well as 1,000 bonus Starpoints for every five nights, up to a max of 4,000 bonus Starpoints. You must register by March 31, 2015 and the promo runs January 5 through April 15, 2015. Club Carlson is offering a targeted promo with early access to their Extend Your Stay, Earn 30K offer. If you register by January 12, you’ll get an additional 10,000 bonus points after your first Eligible Stay of two nights or more between January 12 and March 29, 2015. You must register for the promotion using the link sent your email address. As always, it’s free to register for both of these promotions, so it only makes sense to sign up even if you don’t currently have plans to stay with either of these chains. You never know when your plans might change and if you register now you won’t miss out! The hotel shuttle dropped us off at the domestic terminal at the Istanbul Airport. Unlike most US airports where the counters are all in one long line, here there were several different banks of counters and we had to wander a bit to find the Pegasus Airlines counter. But we got checked in relatively quickly. We’d paid for the extra luggage allowance so that we wouldn’t have to worry about our bags being overweight. The terminal itself is nothing fancy, to put it mildly. There were some fast food places and I think one friend bought a soft drink but we didn’t venture further. Clearing security was old-school with metal detectors. Our gate was downstairs in a bare area with a concrete floor and some seats. We were a bit early so just hung out there. The area did start filling up as our flight time approached. When it was time to board, a bus pulled up outside the door and took us to our plane, which we then boarded via a staircase. Pegasus flies 737s between Istanbul and Izmir several times a day for a very reasonable price. We’d booked our tickets via a travel agency/tour operator that not only got us these flights but also booked our hotel in Izmir and the tours we’d take on this trip. The plane’s interior was perfectly functional but tired and a bit beat up. But as the flight was only about an hour, that was fine. Since we’d paid for the upgraded package, we got cheese sandwiches and a drink included, as well as bulkhead seating. In comparison to the Istanbul Domestic Terminal, the Izmir terminal, was quite nice and modern. Lots of space and high ceilings gave it an airy feel. The domestic terminal had just opened in March 2014. On our return, our Izmir guide escorted us to the ticket counter and made sure we got through everything before dropping us off in the security line. Once we were airside we wandered a little bit, looking at the souvenir shops. I was very surprised to find how small the bathrooms were. Naturally there was a line out the door of the women’s side. Very sad to see that in a new airport. Our return flight was much the same as the outbound. We parked at a remote stand at Ataturk and were bused to the terminal. It seemed to take quite awhile for our baggage to be delivered to the belt. So Pegasus does what it needs to do: deliver people safely and on time for a very reasonable price. I’d compare it to flying Southwest Airlines in the US – although you can pre-select your seat. Perfectly fine for short flights though hopefully their international fleet is in better shape than their short-haul domestic fleet. I recently went home to the Nashville area for Christmas and due to a family member’s illness (nothing serious) I ended up staying at the Candlewood Suites in Brentwood, Tennessee for three nights. The rates were extremely reasonable at under $100, but I had a free night certificate since I hold the IHG credit card as well as a plethora of IHG points and no plans for their use at the moment, so I used my certificate and 10,000 points per night for my stay. Did I get maximum value for my points? Absolutely not. 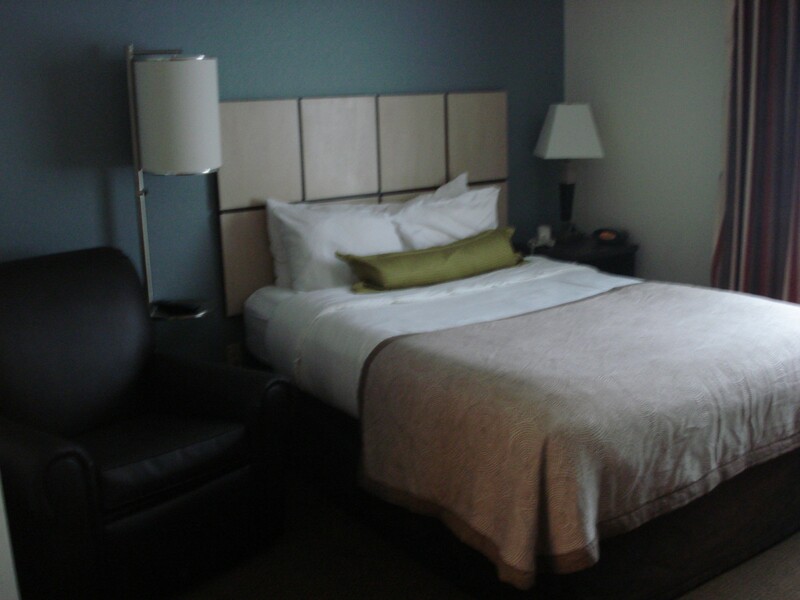 But since I only found out the day before I arrived that I’d need to find alternate lodging, it was nice not to have to shell out any unexpected cash. The free night certificate cannot be booked online, so I called in to make my reservation. At the time I thought it was unusual that the customer service representative asked what time I’d be arriving. Once I got to the hotel I realized it was because the front desk is not manned 24/7 and they have a locker-type facility where after-hours arrivals can enter a code to get their keys. The phone in the room did indicate there is a 24-hour contact number in case something goes wrong after hours, which is good to know. I arrived mid-afternoon and was promptly checked in. I only interacted with the front desk staff at check-in and checkout but they were both very nice and very efficient. My platinum status (from holding the credit card) was recognized and I was offered a choice of welcome amenities: 500 points or a gift bag. I’m not even sure what the bag contained, but I selected the points. There were a couple of luggage carts handy so I used one to take my luggage and Christmas items up to my room. I’d driven from Memphis to Nashville and since there was no limitation on how much “stuff” I could bring, I brought more than I would have if I’d flown somewhere. My room was on the third floor on the back side of the building. This was great because there’s no parking lot behind the building, just a green space, so it’s very quiet. This property is located in a large office park that’s quiet most of the time anyway so I’m willing to bet that outside noise is never a problem. Since the hotel was not full, I was glad the staff had spread the guests throughout the hotel, which also kept noise down. I don’t think anyone was staying in either room next to mine. I just had a standard room, which features a queen-sized bed, a recliner, a large desk/table combination that runs the length of the living area and a kitchenette. The first thing I noticed when I walked in was a sharp perfume-y smell. I’m not sure if it was air freshener or what but I noticed it right by the door and in the bathroom. The next thing I noticed was that my shoes were sticking to the kitchen floor. This also happened in the bathroom. I’m not sure what caused this either but it was a bit annoying. But as it was Christmas Eve at that point and I’m sure housekeeping had left for the day, I didn’t want to bother anybody about it. I liked the rather large, deep closet. If I were staying here for an extended period it would be a fine place to store my suitcase without having to struggle to get it in there. Not shown is an iron and ironing board that were included. The desk area ran along one wall then turned in an L-shape as it reached the kitchen. The desk chair was at the corner of the L which was very handy, like an L-shaped desk. At the end of the L was another chair, which I used for eating breakfast each morning. 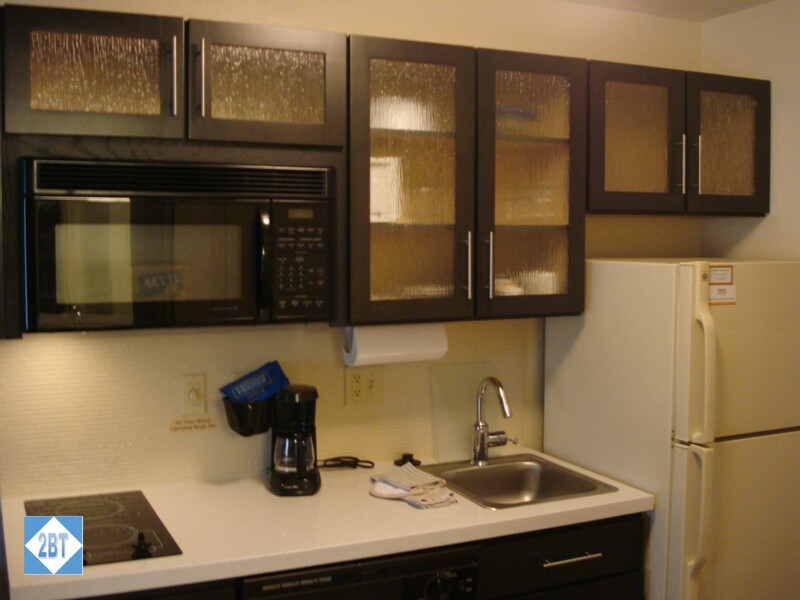 Breakfast is not included at this Candlewood Suites. Not sure if that’s standard across the brand or not. I’d thought Candlewood was meant to be a competitor to Marriott’s Residence Inns and I think all the RIs where I’ve stayed have offered breakfast in the lobby, so it surprised me that Candlewood did not. But since I was driving, I just brought items from home so I didn’t have to go out and buy anything and it was not a big deal. 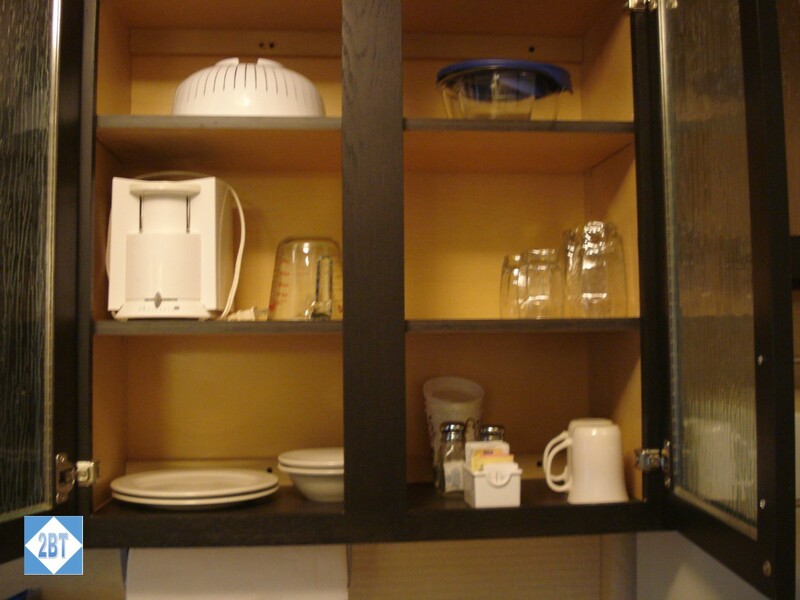 The kitchen seemed to be furnished with two place settings of dining utensils and glasses/plates/bowls, etc. 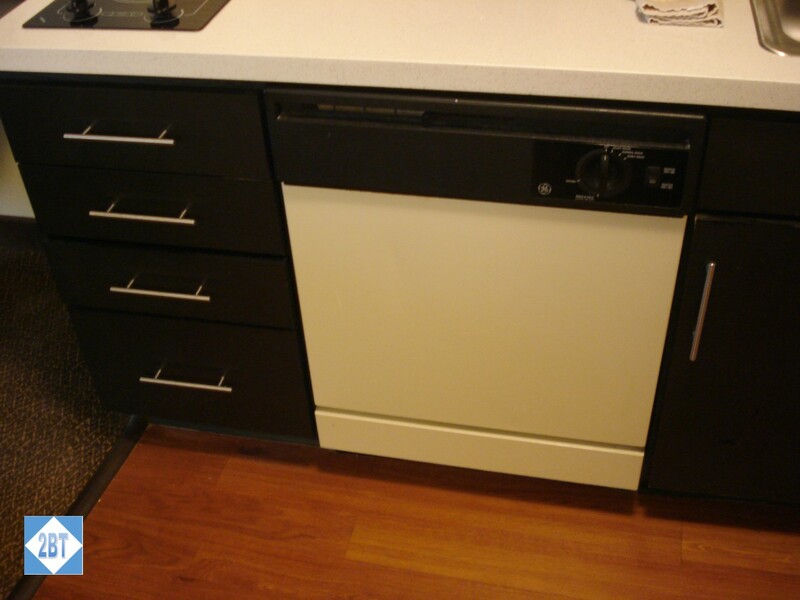 A full-size dishwasher and a full-sized refrigerator/freezer were included as were a 2-burner cooktop and a coffee maker. There was a fair amount of pots and pans but if you needed something that wasn’t in your kitchen, there was a locker down by the front desk where you could check out specialty items and take them back to your room. This locker also had games and DVDs available. I thought that was a nice touch. 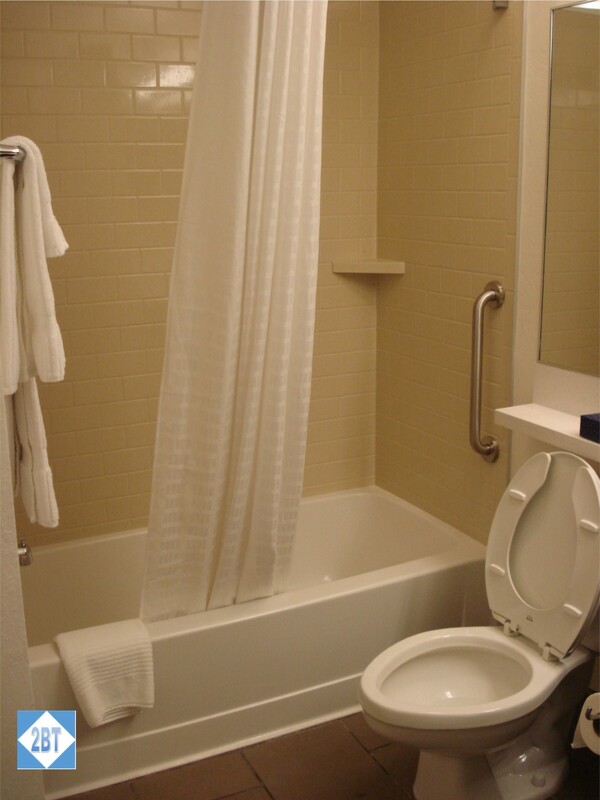 The bathroom was a good size and had a shower/tub combo with a curved curtain rod. The showerhead was minimally adjustable but I couldn’t get the water pressure to beat down as hard as I’d like. I suspect this is because of the good “green” rating this hotel has and the pressure is probably limited on purpose. 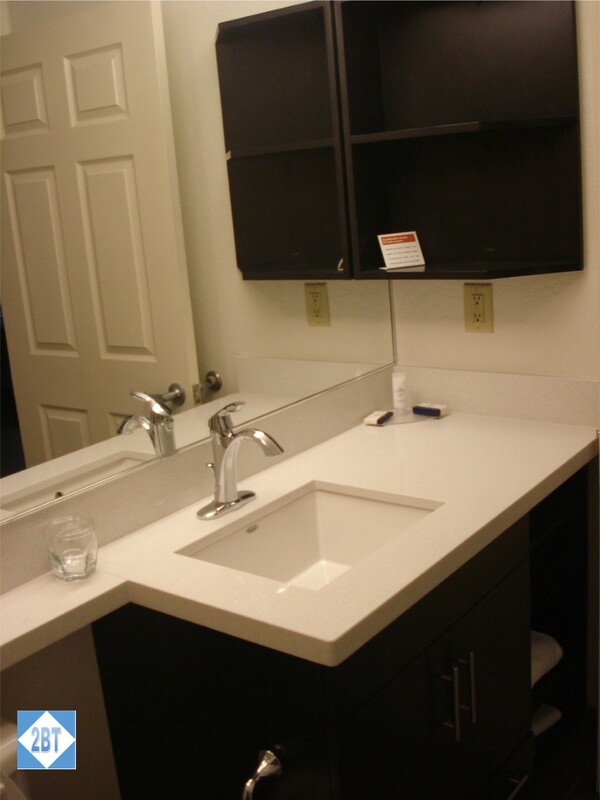 The vanity was slightly high, which I like more as I get older – it means I don’t have to bend over as far over the sink! And there was plenty of counter space for one person’s toiletries. Two bars of soap (one for the sink, one for the bath) were provided as was a combination shampoo/conditioner by Pantene. I really prefer separate shampoo and conditioner but this was fine for a few days. No lotion or other amenities were provided. The hair dryer was tucked in one of the shelves under the sink and I had to look a bit for it. It was actually pretty strong and I like that it was not one of those that was fastened to the wall. The towels were pretty decent, though naturally not as thick as ones you’d have at home. Maid service only happens once a week at this property though you can get more towels at the front desk in between cleanings, if needed. The bed was pretty comfortable though a couple of the pillows were lumpy. Fortunately there were two other pillows that were ok. I liked that the bed had a fitted sheet, a top sheet and a duvet. I do miss that top sheet when I’m in hotels that don’t provide one! I was able to keep the room comfortable at night by turning the thermostat all the way down (I like it cold!). There was a note that the thermostat cuts off when you leave the room for 15 minutes. I don’t know if it does that if there’s no activity in the room while one is asleep or not but I did wake up hot at one point but I can’t remember if the air came back on or not as I threw the duvet off for awhile. Wi-fi was free but seemed to get a little bogged down in the evenings when lots of people were connected. I woke up in the middle of the night at one point and was browsing on my tablet and it seemed much faster then. Downstairs there was a surprisingly good gym. Not large but it had quite a few machines. I wish I’d thought to bring workout clothes to make use of it. 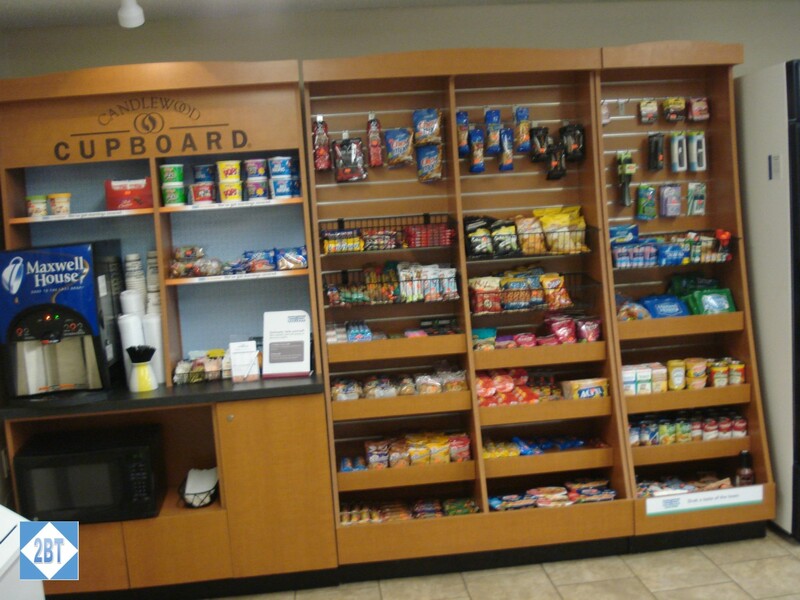 There was also a cupboard area where you could fill a bag with food items for a single price and take it to the front desk to pay for it. Very convenient for those who don’t want to trek to the grocery store. 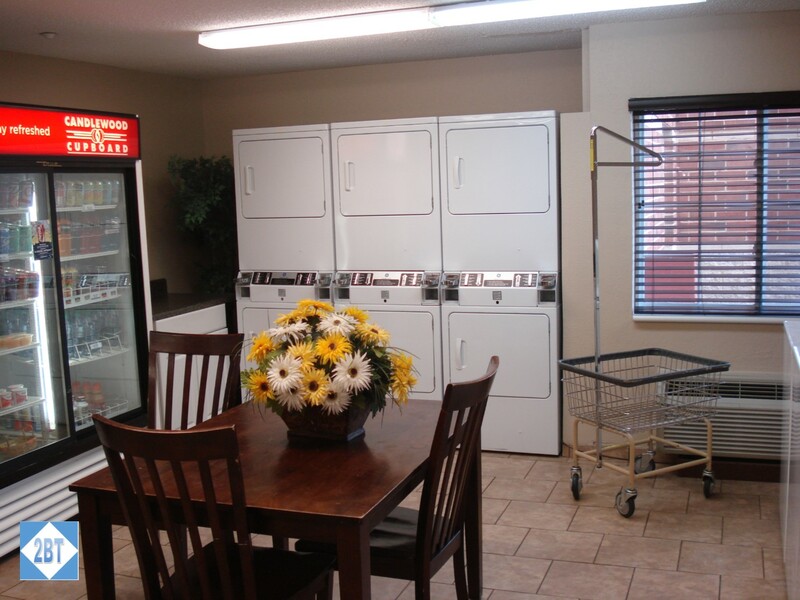 There were also free laundry facilities in this space. I saw at least three pairs of washers and dryers. That would be extremely handy were I staying here longer term. Would I stay here again? Well, the price was right. I do feel like it’s a half-step down from a Residence Inn. There is a Residence Inn in the same area though I don’t have nearly as many Marriott points on hand as I do IHG points. Plus my Marriott points can be used at Ritz-Carltons, where I get much better value for them. 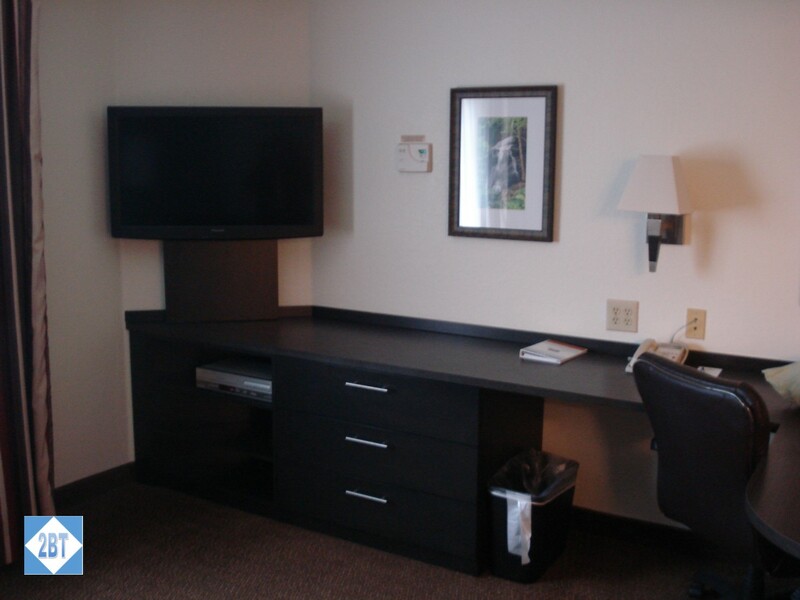 Even for paid stays, the Candlewood Suites are much less expensive than the local Residence Inn. So, I’m not sure what I’d do next time – hopefully everybody will be well and I can stay with family for free! For the next week, through January 8th, United is offering a 30% discount in the cost of fees for transferring MileagePlus miles from one person to another. You must transfer at least 2000 miles and there is a 100,000 mile maximum. Is this a good deal? 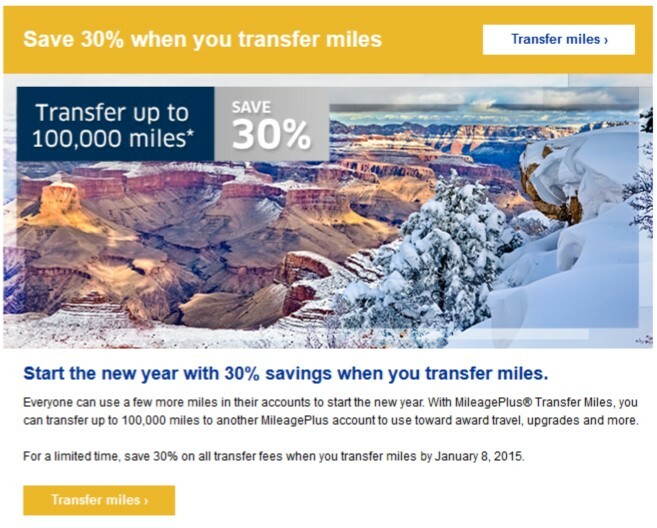 Transferring miles is rarely a good deal, even with a discount. This is because most frequent flyer programs – including United – allow you to use your miles to book an award ticket for someone else. So there’s usually no need to transfer tens of thousands of miles to someone else. But, if the other person only needs a few thousand to top off an award, it might be worth it. The transfers cost $10.50 per 1000 miles along with a $14 processing fee for each transaction. Note that you can only transfer 25,000 miles to a single recipient per calendar year. If you want to transfer miles, click here to go to the United website.